It's been an annual tradition for 44 years, and the Delhi Fair on the Square will return again this summer! 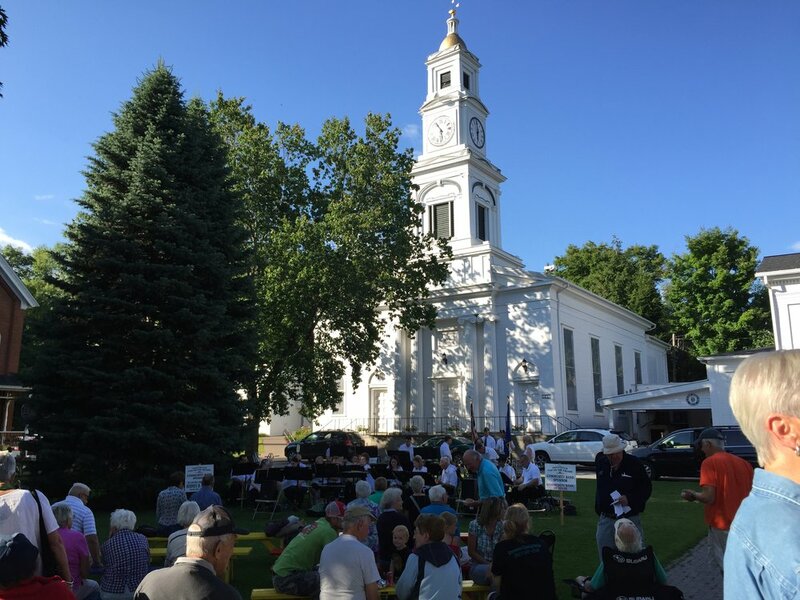 Every Friday during the month of July, the community gathers together on Courthouse Square to enjoy live music in the gazebo, local vendors, kids' games, crafts, food, and each other. Join us for beautiful summer evenings on the Square! The Fair on the Square is brought to you by the Delhi Fire Department, Delhi Kiwanis Club, Delhi Masons, Delhi Rotary Club, Delhi Women’s Club, and Knights of Columbus. We love the warm weather because it means Farmers' Markets! The Delhi Farmers' Market is a wonderful opportunity to connect with local farmers and producers. Shoppers can expect a wide array of products including fresh local produce, cheese, fresh baked goods, locally raised bedding plants and hanging baskets, locally produced crafts and maple products. Purchasing locally grown produce and products keeps more capital in the community and it is environmentally friendly since it was grown or produced within a drivable distance, reducing the amount of resources required for transport. This year's market will have something for everyone. Join us every Wednesday through September at Courthouse Square in Delhi! The Greater Delhi Area Chamber of Commerce would like to congratulate The Cardio Club on being announced as our first Dr. Candace Vancko Grant recipient. Co-owners Raegan Reed and Laura Stewart submitted the winning application with a commitment to expanding their product line and services in an effort in increasing health and wellness in the community, specifically the SUNY Delhi student population. This is a matching grant that the Greater Delhi Chamber of Commerce will be awarding annually to the area member business that is ready to invest into their business with the purpose of directly impacting the student population of SUNY Delhi. This can take many forms, including, but not limited to, adjusting inventory, adding an attraction, or offering a new service with the primary focus of better serving and connecting to the SUNY student population. We will be doing a call for applications again in September 2017. If you are interested in attracting the student population to your business with a unique and innovative approach and are willing to match our investment of up to $500, we suggest that you apply. Please sign up for our email newsletter to get the latest news and updates. Please join us in congratulating Cardio Club. The Greater Delhi Area Chamber of Commerce (GDAC) is hosting the 33rd Annual Delhi Harvest Festival on Saturday September 23rd from 10 a.m. to 4 p.m. The festival will take place at Delhi's Courthouse Square on Main Street in Delhi and will happen RAIN OR SHINE. Over 60 vendors will be selling wonderful items including all sorts of jewelry, handmade gifts, yarns, art work, handbags, baked treats, wooden items and much more. From noon until 4:00 p.m., the band Bluestone Country will perform in the bandstand for all to enjoy. The Automobile Endurance Run will be traveling through Delhi on the same day as the Harvest Festival. It's going to be a great day in Delhi! Only one of each Direct Company will be permitted. REGISTRATION IS CLOSED! Contact Christina at delhichamber@delhitel.net to check for openings. What name do you want on the map? Note: All vendors selling food are responsible for making sure they meet New York State Department of Health regulations. If you have questions, please contact the local office for the Department of Health at 607-432-3911. Please use the PayPal link at the bottom of this form or mail a check for the appropriate amount to the Greater Delhi Area Chamber of Commerce at PO Box 46 in Delhi, NY 13753 in order to reserve your location. If you have been a vendor before, what spot were you assigned? If you cannot remember the number you were assigned, please tell us about where you were located for the event. Thank you for registering for the 2017 Delhi Harvest Festival on Saturday, September 23. Share the Delhi Harvest Festival event on facebook! To hold your vendor spot, please mail a check or money order payable to the Greater Delhi Area Chamber of Commerce and proof of insurance. PO BOX 46, Delhi, NY 13753. Thanks for being a part of this great event!! 1) Spots will be assigned after payment is received. 4) All vendors can check in between 8am and 10am. 5) There will be no electrical or water hook ups available. 6) We must be notified if working out of a motor home or the back of a vehicle as those spaces are limited. 7) No lawn or garage sale items. No refunds will be given and payment is required to secure a spot at the festival. Select the space you are registering for, then add to cart and complete payment process. Did you know that New York State is home to the largest resource of tappable maple trees within the United States? Our state’s unique climate and forestry make it naturally perfect for maple syrup production. As a result, there are hundreds of maple syrup producers in our state making some of the finest maple products you will find anywhere. On the weekends of March 18-19 and March 25-26, New York State celebrates maple production with the annual, state-wide Maple Weekend. Here in the Greater Delhi Area, Catskill Mountain Maple will be participating on both weekends by offering a special pancake breakfast event. Details below. A pancake breakfast with maple syrup, eggs, sausage and a beverage will be served by local 4-H Clubs. Suggested donation is $4/person to help support 4-H Camperships to Camp Shankitunk in memory of Terry Kaufman. You will also be able to buy maple products such as maple syrup, maple granulated sugar, maple cream, maple cotton candy, maple jelly, maple-coated nuts, maple mustard, and maple popcorn. On Saturday, March 18, meet on Main Street, Delhi, NY, at 12:00 pm for the St. Patrick's Day Parade start and enjoy pipe bands, floats, community leaders and kids of all ages as they celebrate the day! After the parade, there are brief performances on the Court House Square with some vendors. As is tradition, festivities continue at O'Neill's Shire Pub at 123 Main Street where food and drink flow until the evening. Local rock band Esquela kicks off in the bar at 4pm. Let's be honest - as beautiful as the winter season is here in the Catskill mountains, month after month of darkness and cold weather can leave many of us feeling a bit gloomy. Various degrees of "winter blues" are very common. If that sounds familiar, don't give up! We've put together a list of easy, fun things you can do to cheer up and beat those blues right here in Delhi. Go ice skating. The ice rink next at Sheldon Park by Delaware Academy is open again this year. It's free and open every day from 8am to 8pm, and loaner skates are available. Keep an eye on Facebook for current news and exceptions due to weather. Good old-fashioned winter fun! Or how about sledding? There's a great hill at the college where you'll often see families bringing their kids to go sledding. As you take a turn from Main Street towards Delhi Drive, the hill is on the left hand side next to the SUNY Delhi welcome sign. -- These three trails over the school were named after the My Side of the Mountain novel (which famously takes place in Delhi) and were designed to promote health and well-being in the community. -- Bramley Mountain Trail is a new 4-mile trail between Delhi and Bovina, built by the Catskill Mountain Club. -- Delhi College Golf Course is open to the public all winter long for cross-country skiing and snowshoeing. -- For those willing to drive just a little out of town to Bloomville, Catskill Scenic Trail is excellent for skiing, snowshoeing and hiking. Take a long walk around town. There are many easy routes to take in and around the village. Get going and enjoy looking at beautiful houses and yards. For a little challenge, walk up the hill to the college and visit the campus. At the very top, there's a beautiful view over the town. Looking at the layers of rolling mountains in the distance and all the homes and buildings dotting the hillsides and valleys, it's hard not to appreciate the beauty of where we live. -- Saturday, January 28th at 5pm: Annual Casino Night by Delhi's C.L.A.S.I ladies. A fun-filled evening of games and good times. Location: Delhi American Legion. -- Saturday, February 18th at 12pm-2pm: Frosty Family Fun Day at the Sheldon Park ice skating rink. Skating, snowshoeing, food, games and more. Browse the many wonderful shops along Main Street. We bet you'll find something you've never visited before. Take a look and appreciate all that our local entrepreneurs are doing and support their businesses. Eat out. Is there a restaurant you haven't tried before? Take a fitness class. How about yoga, spinning or zumba at The Cardio Club? See the full class schedule here, get a membership to the gym, or join the LiveFit Challenge! Catskill Kettlebells also offers open gym as well as different levels of kettlebell classes that are all the rage right now. Let's get in shape, Delhi! Believe it or not, summer will be here sooner than you think. Did you know the swimming pool at SUNY Delhi is open to the public? Open swim hours at Kunsela Hall Pool are 8pm-10pm on Mondays through Thursdays, 5:30pm-9pm on Fridays, and 1pm-5pm on the weekends. Free to college faculty and staff, and just $5/adults, $3/kids and $4/seniors. Need a little pampering or pain relief? Get a massage. Jess About Massage offers many types of massage, including hot stone, bamboo and Swedish massage. Attend local basketball team home games. Delhi Broncos, the SUNY Delhi basketball team, and Delhi Bulldogs, the Delaware Academy basketball teams, compete in tournaments over the winter, and home games are always free and open to the public. Get in the community spirit and support our teams! -- Schedules for Delhi Broncos women's basketball and men's basketball. -- Schedules for Delhi Bulldogs girls' basketball and boys' basketball (select varsity or JV from drop-down menu). Go to church - there are almost a dozen churches and many denominations in Delhi - see a list here and find your home church. Most have Sunday services as well as prayer groups or other gatherings throughout the week. Get involved! -- Heart of the Catskills Humane Society needs dog walkers, cat petters and other assistance for shelter pets. To go a step further, consider adopting one. -- Youth mentors, anti-violence hotline responders and more are needed at Delaware Opportunities. -- Help our seniors at the Office for the Aging by offering transportation, assisting at dining centers, and more. -- Delhi Food Pantry offers free emergency food to individuals and families in need and would appreciate volunteers. -- Contact the Alcohol and Drug Abuse Council of Delaware County to see how you can be of help. -- Have more volunteering ideas? Let us know. Enjoy the nightlife! Our local pubs often feature live bands and special events. Always keep an eye on the town's events calendar to see what's going on. Trivia night? Karaoke? It's all there. Go ahead and submit your own event, too. Most importantly, let's smile and be kind to each other! Lend a helping hand or say something supportive to people you meet. We're all in this together. Winter is the perfect time to come to the Greater Delhi Area. There is so much to do, so many ways to get you through what might be the winter blues for some. Save the date for this very special day of skating and family fun. Sponsored by the Greater Delhi Chamber of Commerce, we welcome the community and visitors alike to join us on the Delhi Ice Skating Rink for an afternoon of skating, food, games and so much more. Please save the date and join us for this special event. More details to follow!